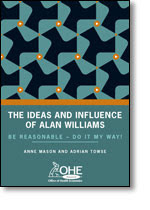 BE REASONABLE: DO IT MY WAY!The sign on Alan Williams’ desk revealed his sense of humour, a man who invited and relished debate, but always recognising that intellectual pursuits were a means to a practical end. Perhaps best known for his work within cost-benefit analysis, Alan Williams was a man of principles who developed guiding values in healthcare economics that embraced and encouraged active intellectual engagement and progression. He was concerned with the philosophical and ethical issues that underpin decision making and his courageous intellectual battles bore new ideas and revised ideology. This compilation of papers and further discussions arising from the Alan Williams tribute conference provides an analysis of the evolution and current status of key concepts in the field. It is highly recommended for health economics professionals and students.